Learn how to monitor F5 BIG-IP LTM devices using the F5 LTM ActiveGate extension. 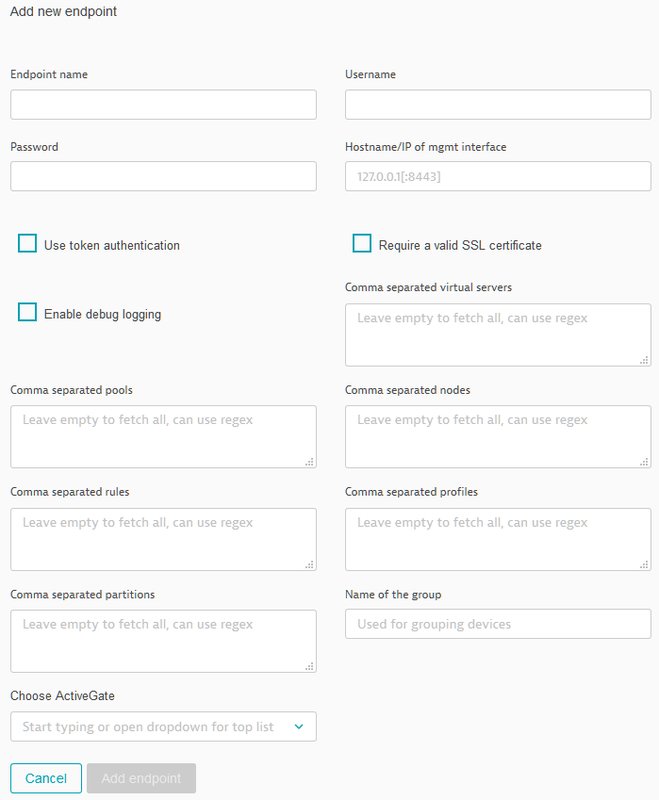 To create an authentication token with the User authentication API, submit a POST to https://BIG-IP-ADDRESS/mgmt/shared/authn/login including a data parameter that triggers the generation of an authentication token. Interested in monitoring F5 LTM with Dynatrace? Obtain the install file (custom.remote.python.f5.zip). Don&apos;t rename the file. Unzip custom.remote.python.f5.zip to the plugin_deployment directory of your ActiveGate host. If the resulting directory structure isn&apos;t .\plugin_deployment\custom.remote.python.f5\, please make the neccessary changes. Click the Upload plugin button and upload custom.remote.python.f5.zip. Username: The username for connecting to the iControl® REST API. Hostname/IP of mgmt. interface: The hostname/IP where the mgmt. interface is listening, defaults to port 443 (HTTPS). Use token authentication: Use token authentication instead of direct connection. Required for LDAP integrated users. Require a valid SSL certificate: (Un)checked depending on whether or not a valid SSL certificate is required. Enable debug logging: Leave unchecked by default, can be checked if requested by support for investigating an issue. Comma-separated virtual servers: Allows for filtering which virtual servers should be monitored. Comma-separated pools: Allows for filtering which pools should be monitored. Comma-separated nodes: Allows for filtering which nodes should be monitored. Comma-separated rules: Allows for filtering which rules should be monitored. Comma-separated profiles: Allows for filtering which profiles should be monitored. Comma-separated partitions: Allows for filtering which partitions should be monitored.